Calling all peanut butter lovers! 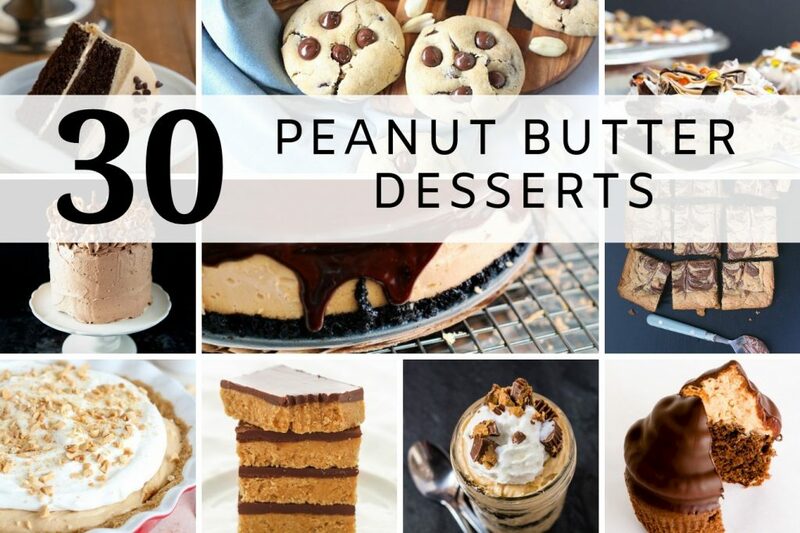 Check out this collection of 30 peanut butter desserts to satisfy any peanut butter craving you may have! Are you craving a treat loaded with salty-sweet peanut butter flavor? 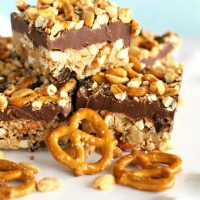 Whether you love peanut butter and chocolate, peanut butter and Nutella, or just straight peanut butter treats, there’s bound to be a recipe below that you’ll love! There’s even a few healthy ones in there! In the mood for peanut butter cookies? Cake? Cheesecake? Fudge? I have collected recipes from fellow food bloggers for every peanut butter craving! Chocolate Peanut Butter Cake is rich and creamy, made with cocoa powder and peanut butter, ready in under 60 minutes! Who doesn’t love the combination of peanut butter and chocolate. This Chocolate Peanut Butter Cheesecake with Pretzel Crust has all that plus a bit of salty in the delightful Pretzel Crust! 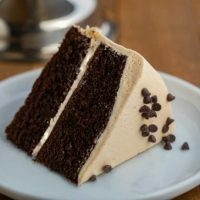 Peanut butter and chocolate is one of those flavor combinations that work perfectly to create something that is better than either of them individually. 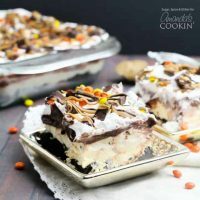 This easy no-bake chocolate peanut butter lasagna is bursting with peanut-butter-chocolate-goodness. These babies are rich and decadent so a little goes a long way, plus if you cut them into smaller squares you won’t feel as bad for eating multiple. Love Chocolate Peanut Butter Cheesecake? You’ll love this no bake cheesecake dip! 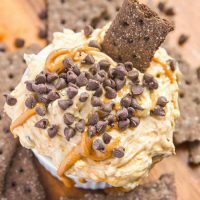 This No Bake Chocolate Peanut Butter Cheesecake Dip has all the flavors you’d love in a traditional cheesecake without the need to bake! Sweet-and-salty treats are a favorite of many. That these are no-bake is an even bigger plus! Rich Chocolate Stout cake layers filled with peanut butter Swiss meringue buttercream frosted in a chocolate peanut butter buttercream frosting. Flourless Peanut Butter Oatmeal Chocolate Chip Cookies are easy grain and refined sugar free cookies packed with peanut butter, chewy oats and dark chocolate! 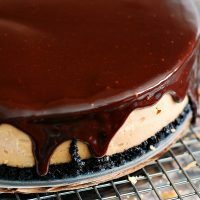 peanut butter pie is a delicious no bake dessert, with an Oreo crust, and creamy peanut butter filling, all topped with a rich chocolate ganache and peanut butter cups. The pie that peanut butter fans will go crazy for. Graham cracker crust, peanut butter filling, and freshly whipped cream. You won’t be able to stop eating this decadent and delicious No-Bake Peanut Butter Pie! Indulgent bites of peanut butter cheesecake mixed with mini chocolate chips and covered in sweet and smooth Ghirardelli melted chocolate. 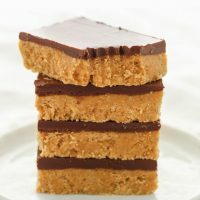 These No-Bake Chocolate Peanut Butter Bars only require 5 simple ingredients and can be prepared in about 10 minutes. The perfect easy dessert for chocolate and peanut butter lovers! nutella peanut butter chip easy no-churn ice cream, made with cream, sweetened condensed milk, nutella and mini peanut butter chips. Fast and easy no-churn ice cream, can’t get much better than that. 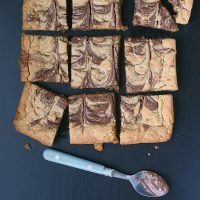 Fudgy peanut butter blondies swirled with Nutella. Need I say more? Old Fashioned Eggless Peanut Butter Cookies are simple homemade peanut butter cookies made with no eggs but taste just like the classic peanut butter cookies you remember from your childhood. Calling all peanut butter fans! This Peanut Butter and Banana Yogurt Pops recipe is healthy, easy-to-make, and you’ll only need 4 simple ingredients. Dense, chewy, and intensely peanut buttery, these peanut butter blondies come together in one bowl and half an hour. No complaints here. Creamy peanut butter cheesecake is layered over an Oreo crust and topped with rich nutella ganache! Peanut Butter Chocolate Chip Shortbread Cookies are an easy to make slice and bake chocolate chip cookie recipe with a melt in your mouth texture, a light peanut butter flavor, and plenty of chocolate chips! Peanut butter and chocolate are one of the most delicious flavor combinations. Peanut Butter Chocolate Lava Cakes bring the two together for a delectable, molten lava, chocolate dessert. Who doesn’t love peanut butter cups and brownies? 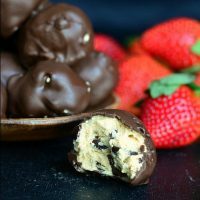 Put them together along with a peanut butter mousse and whipped topping and you will love every single bite! This Peanut Butter Fudge is extremely popular during the holiday season and it’s no wonder why! With just 6 staple ingredients and 10 minutes hands on time, this easy peanut butter fudge recipe makes the perfect holiday treat! This cake is loaded with peanutty goodness -- the only thing you’ll need to enjoy this treat is a tall glass of milk. Do you ever find yourself at home wishing you had just a little something sweet? Here's a solution for you: Peanut Butter Lovers Chocolate Chip Mug Cake. It cooks in 1 minute in the microwave and is flourless (so naturally gluten-free)! 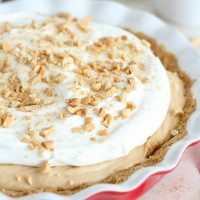 A creamy no-bake peanut butter filling is piled high with fluffy meringue in this dreamy Peanut Butter Meringue Pie. 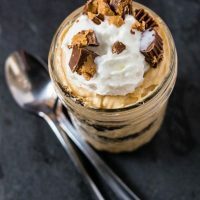 Peanut butter mousse parfaits are decadent yet light, fancy yet approachable. Creamy peanut butter mousse is layered with chocolate cookie crumbs for textural interest. This delectable truffle's filling is simply peanut butter, butter, powdered sugar, and graham crackers. It’s put together, rolled into balls, and dipped into chocolate. These Salted Peanut Butter Rice Crispy Treats are an easy, sweet and salty treat. Made with no refined sugars and all natural peanut butter, they are vegetarian, gluten free and paleo. If reincarnation exists, I would come back as this Soft & Chewy Peanut Butter Chocolate Chip Cookie!